Worried about the shambling dead? 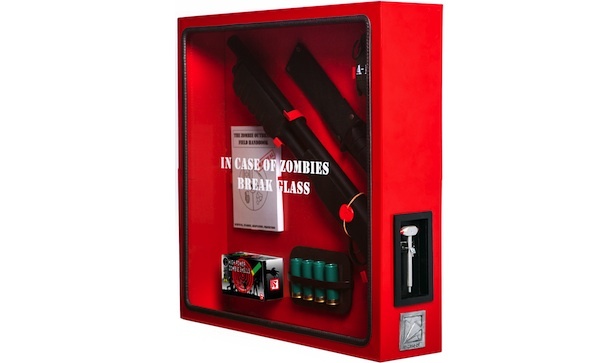 This break glass in case of zombie kit ($260), which contains: a 12 gauge short barrel shotgun, a hunting knife with belt sheath, a hand grenade, a zombie outbreak field handbook, 10 shot gun shells in a box,4 shot gun shells on leather belt holder, and an emergency hammer. None of these things are real, of course. And if that makes you upset, remember: the zombies aren’t real either.